The gameplay in Sunday Lawn Seasons really couldn't be simpler. 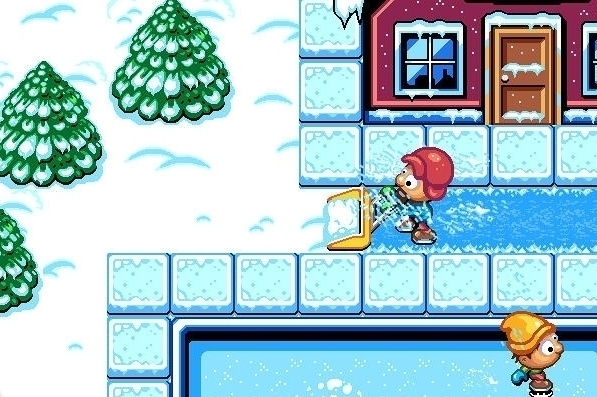 Across a series of tile-based stages, you use screen swipes to send a gardener scooting off in that direction. Certain tiles have special properties, and the challenge is to simply create the longest consecutive path of these particular tiles in exchange for juicy combo scores. Not only that, you'll also have to dodge the wandering animals who'll put a stop to your score attempt if you collide with them. Donut Games has done a really nice job of infusing extra character to the core gameplay of the original Sunday Lawn. Each season offers up its own specific challenges - hoovering up leaves in Autumn, shoveling snow in Winter, and planting grass seed in Spring. There's not just a decent collection of level arrangements to plow through (no pun intended) either, the animal types all have their own behaviors and pathing preferences. There's no getting away from the fact that this is incredibly simple gameplay, stretched over a large number of levels. That wouldn't so problematic, were it not for the fact that you get very little time to actually plan your perfect pathing route. And even that wouldn't be a problem if the controls didn't have a tendency to get away from you from time to time - sending you into the path of a wandering creature, for example, or just messing up a delicious line of tiles. It only happens sometimes, but it's still annoying. Even if you embrace the simply and repetitive pathfinding gameplay, you may find the sometimes slippery controls leave you feeling robbed from time to time - a pity, as we definitely had our share of fun with the game. A free-to-play offering with the option to earn or purchase new level packs would also have helped Sunday Lawn Seasons stand out much more in a tough week of new releases.